With the call for holiday breads from YeastSpotting last week, I set out to come up with a recipe of my own. 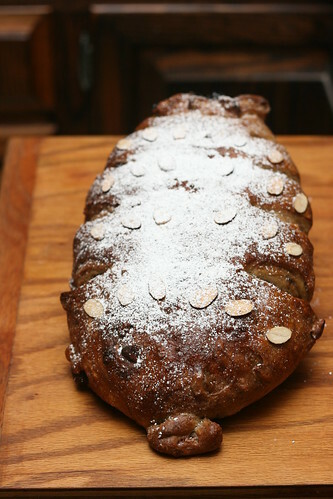 I was looking for something that wasn’t just an enriched bread with dried fruits and nuts, as so many holiday breads seem to be. But, racking my brain, nothing lacking the fruits and nuts seemed holidayish enough! So, back to the drawing board. I decided to mull the dried fruit I used in a brandy and orange juice mixture with plenty of spices. The fruits absorbed a lot of the liquid, and most of the rest cooked off. What little was left I used to do a quick sort of glaze on the walnuts included in the dough. I also tried to come up with sort of a Christmas tree shape for the loaf… that didn’t work so well! Now, I got called in for jury duty and I’m a little pressed for time so the instructions will be brief. Time: Day 1: Elaborate starter. Day 2: Mix final dough, fold dough and retard. Day 3: Shape, proof, and bake. If using commercial yeast, you can do this in 2 days. Day 1: Make preferment. Day 2: Mix final dough, fold and ferment, shape and proof, bake. Elaborate your starter however you choose, but ending up with the same flour and water weights. (or make a preferment) Allow it to rise overnight. The next day: put the dried fruit in a small pot or pan big enough to hold the orange juice, brandy, almond extract, and fruit. Add the brandy and orange juice, you can use less than I call for if it just barely covers the fruit. Add whatever spices you want to the fruit and liquids. Heat this mixture over very low heat stirring occasionally until the fruits have plumped visibly and most of the liquid is gone. Strain the dried fruits and reserve, pour the remaining liquid back into the pan and add the walnuts. Cook over low heat stirring occasionally until nearly all of the remaining liquid is gone, and partially glazed onto the walnut pieces. Stir together the flours, salt, and spices. Cream the starter or preferment with the water, then mix in the eggs, yolks, butter, and honey. Pour the liquid ingredients into the dry, add the orange zest and mix until the dough forms a loose ball. Let the dough sit for 20 minutes, they knead it very briefly to make sure everything is well incorporated. 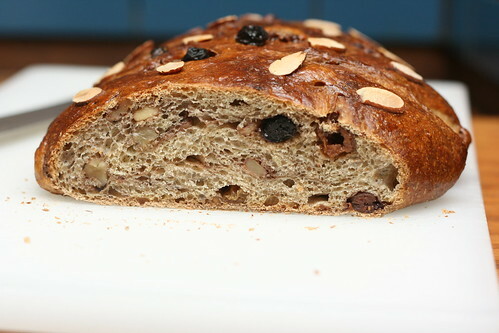 Flatten the dough out and spread as much of the nuts and dried fruits as you can add on top of the dough. Fold the dough over itself, give it a few kneading turns then add as much of the remaining fruits and walnuts as possible, continue until no fruits or nuts are left. Form the dough into a ball and put it in a covered and oiled bowl to ferment. Give the dough a stretch and fold at the first and second hour marks, immediately after the second fold make sure the dough is well covered and retard it overnight in the refrigerator. The next day, gently remove the dough from the bowl and slowly degas it. Seperate the dough into two or three pieces, and shape them into whatever shape you are planning on making. Prepare 2 or 3 baking sheets with parchment paper and place the shaped loaves onto them. Whisk the egg whites until just barely frothy and give each loaf an egg wash, then spray with oil and cover with plastic wrap or put in a food grade bag to proof. When the loaves are proofed, preheat the oven to 350° with the rack on the middle shelf. 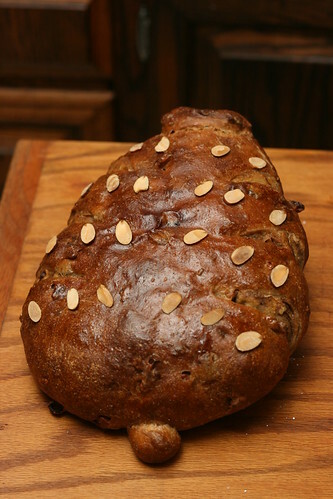 Give the loaves a second egg wash and top with sliced almonds. Place loaves in the oven and bake for 20 minutes, then rotate the loaves 180° and continue baking for another 20-30 minutes. (Because of the egg wash these loaves should brown quite nicely) When the loaves are finished, remove from the oven to cooling rack and cool at least one hour before slicing. Well, I don’t quite have a name for it yet, and the shaping didn’t turn out quite how I wanted, but the bread was delicious! 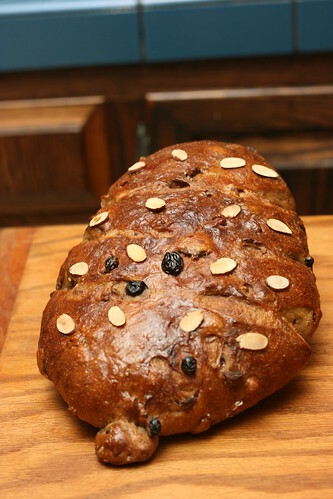 The bread is not overly sweet, but the dried fruits are just loaded with flavor from the mulling, so, I’m proud to send this to YeastSpotting for the holiday breads! For me, it looks like perfect Christmas tree. Rich and beautiful. Nothing like a little brandy to liven up some dried fruit. Essential for the holidays. What a great bread! Thanks for the comments! I’ll have to work on making it a bit more tree like next year, but this was passable. The brandy, orange juice, and spices really made the fruits special. Some of them kept a lot of the liquid inside of them and would burst with it when you ate the bread! This is just the bread I have been looking for! Can I let it rise overnight out of the fridge? I love no knead bread. I think I would use regular loaf pans or tube for this. This is really sensational !